In front of a packed house on Wednesday night, DiBella Entertainment returned to B.B. King Blues Club & Grill in midtown Manhattan for the latest installment of Broadway Boxing. The bouts were streamed live on DiBella Entertainment’s Facebook page. Broadway Boxing is presented by Nissan of Queens, Azad Watches, OPTYX and Christos Steak House. In the main event, Noel Murphy, 139.2 lbs., of Woodlawn, NY, by way of County Cork, Ireland, and Brooklyn’s Mikkel LesPierre, 139.4 lbs., waged a barnburner for 10 thrilling rounds. It became a war of attrition with many ebbs and flows between the two southpaws. Murphy stormed out of his corner and was the aggressor for the first two frames, focusing a lot of his attack downstairs. In the third, LesPierre stymied that pressure with expert footwork and counter shots. The middle rounds were close, though LesPierre’s right hooks created a bruise underneath Murphy’s left eye. The sixth featured plenty of exciting exchanges then LesPierre found the proper distance again to land combinations led by his potent uppercuts. With a sense of urgency, Murphy picked up the pace in the ninth and never let up for the remaining six minutes, attacking the body and continually moving forward. However, he also lost a point in round nine for a rabbit punch, which was the deciding factor in the decision. The judges tallied 97-92, and 95-94 twice, all for LesPierre, now 19-0-1 (8 KOs), who seized the WBC USNBC super lightweight title with the victory. Murphy is now 12-1 (2 KOs). Without the point deduction, the bout would have been declared a majority draw. Born in Trinidad and Tobago, LesPierre moved to the US at age six and was raised in the Flatbush neighborhood of Brooklyn, NY. He is trained by Don Saxby out of Gleason’s Gym. In front of a large cheering section, the popular Jude “King Zar” Franklin, 128 lbs., took on Italian Floriano Pagliara, 129.6 lbs., in a battle of Brooklyn. The contest began with wild exchanges, though Franklin was the more accurate puncher. Backing Pagliara into the ropes, Franklin planted a right hook to the body followed by an overhand right upstairs to drop his fellow Brooklynite just one minute into the bout. Trained by Elmo Serrano out of Gleason’s Gym, Franklin kept up the pressure, digging shots to the body. A game Pagliara tried to fire back in round two, but that only left himself open for counters. Franklin landed a straight right that decked Pagliara a second time, resulting in a TKO stoppage at 1:31 of the second stanza. Franklin’s record now stands at 7-0 (6 KOs), while Pagliara fell to 16-8-2 (7 KOs). Making his DBE debut, Ukrainian heavyweight prospect Oleksandr “Sasha” Teslenko, 220 lbs., of Toronto, Canada, patiently stalked Keenan Hickman, 269.2 lbs., of Baton Rouge, LA, from the outset, landing stiff jabs to the midsection before launching powerful straight rights. One straight right wobbled Hickman near the end of round one. The same punch dropped Hickman in the second. Though he arose, Hickman endured another 20 seconds of punishment before the referee halted the bout at the 1:09 mark. Hickman’s ledger dipped to 6-3-1 (2 KOs). The 6’5″ 25-year-old Teslenko, born in Chernivtsi, Ukraine, improved to 12-0 (10 KOs). Teslenko, now managed by Gary Freedman, took up boxing at age eight at the behest of his father. As an amateur, Teslenko became a three-time Ukrainian National champion while accumulating an impressive 224-23 record. During this time, Teslenko also earned a degree in Marketing from the University of Chernivtsi and served in the Ukrainian Army alongside DBE stablemate Ivan Golub. In his New York debut, East Hartford, Connecticut’s Mykquan Williams, 146 lbs., finished Preston Wilson, 142.8 lbs., of Parkersburg, WV, inside the opening frame. Williams quickly found a home for his straight right upstairs, clearly bothering Wilson. Near the bell, a three-punch combination started by a right uppercut dropped Wilson for the full count, ending the contest at the 2:59 mark. Wilson fell to 4-3-1 (3 KOs). 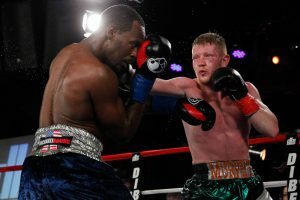 Trained by Connecticut Boxing Hall of Famer Paul Cichon and managed by the renowned Jackie Kallen, Williams upped his record to 10-0 (6 KOs). Williams was also a decorated amateur with a 45-13 record, highlighted by three gold-medal performances at the Ringside World Championships, in addition to winning the PAL Tournament and Silver Gloves Championships. Heavyweight prospect Stephan Shaw, 261.8 lbs., of St. Louis, MO, dominated Joel Caudle, 265 lbs., of Raleigh, NC, over six frames en route to a unanimous decision in his DBE debut. Shaw’s offense steadily increased as the fight wore on; beginning with stiff jabs to keep a proper distance to land straight rights and short left hooks. Soon after, Shaw added hooks to the body to his arsenal followed by combinations. Caudle was game, landing his own leather in exchanges, but Shaw remained in control throughout. Scorecards read 60-54 twice, and 59-55, to up Shaw’s record to 10-0 (6 KOs), while Caudle, 7-2-1 (5 KOs), suffered his second defeat. Following a stellar amateur career that included 2013 PAL and USA National Championships titles, Shaw turned professional in December 2013. Managed by David McWater’s Split-T Management, Shaw trains with four-time Olympic Boxing coach Basheer Abdullah out of Arena Gym in San Diego, California. Southpaw Jonathan Arroyo, 146 lbs., of Patchogue, Long Island, NY, improved to 2-0 (1 KOs) with a second-round stoppage of Andrea Crepaldi, 142.2 lbs., of Manhattan, NY, who was making his pro debut. Arroyo used his height and reach advantages to keep Crepaldi at the end of his power shots, landing a series of hooks to stagger his foe and force a stoppage at the 2:59 mark of round two.